One of the great things about twitter is sometimes, when you tweet someone who's on a TV show and the person tweets back. The first time it happened to me, I had a flurry of @ messages from people who saw my twitter handle mentioned in a post from none other than Jillian Michaels! I had no idea since I didn't follow her, but she did reply to a snarky comment I made. Other times, the mentions are much more useful and answers to questions. And, that brings us to what this post is really about. My market had a large quantity of cherries at a closeout price. I paid about $2/lb! Super great price here in dixie! So, I tweeted Mary Beth Albright who's on this season's Next FoodNetwork Star asking for a recipe that uses cherries. 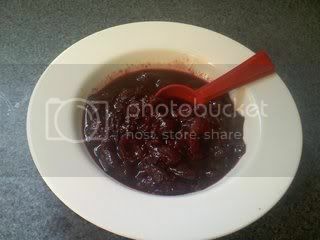 She tweeted back with this fabulous recipe for Cherry Sauce! Of course, I can't do any recipe right. First, no cherry pitter. Never fear, though...A paperclip works in a pinch. yes, a paperclip! Apparently this is a method suggested by Martha herself. Everything else went according to plan. I had a brief moment of panic when I checked my vinegar basket (doesn't everyone have a basket in their pantry devoted solely to vinegar??) and I could only find garlic infused Balsamic. I did manage to find some very cheap balsamic in the back corner of the basket, so it wasn't a total loss. The sauce is amazing, even with using strawberry jam. I can just imagine how good it would taste if I actually did it correctly! I considered serving this over our grilled pork chops tonight, but that idea was nixed by D. He hasn't gotten adventurous enough with his food to mix sweet and savory. So, we're going with the classic...ice cream topping. DELICIOUS! Pit the cherries into a heavy-bottomed saucepan and toss with kirsch. 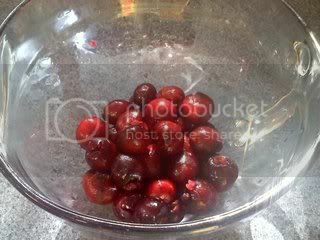 Let sit (unheated) for about 30 minutes, until there’s a good amount of cherry juice in the bowl. Turn the heat on to medium-low and add the cinnamon stick and vinegar. Cook for about 10 minutes, until the juice thickens (if you’re in a hurry, you can add a bit of cornstarch or flour).